Portland, Oregon has become a poster city for the less-lawn movement. Increased planting of “hellstrips” — also known as the berm, curb strip, beltway, verge or parking strip — has contributed greatly to Portland’s flora-friendly persona. Until recently, city bureaucrats weren’t so friendly to the practice. 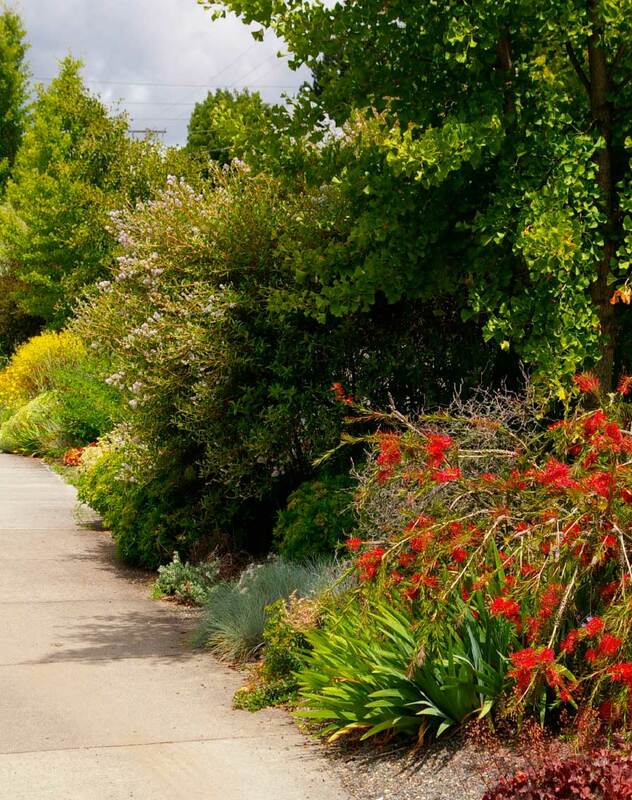 Plant advocates such as Sean Hogan of Cistus Nursery and others have slowly chipped away at the city’s misgivings by pointing out the benefits of cultivating these once-verboten areas. Hellstrips are “the public faces of spaces,” according to Hadden. They are the first impression we get when walking up to a home or entering a commercial building from the street. The term “hellstrip” was coined by author and horticulturist Lauren Springer Ogden. An article in the New York Times quoted Ogden as saying the name “just came out of my mouth. It’s a strip and it’s hellish. It’s hard for plants to grow there.” Deterrents include reflected pavement heat, compacted soil, foot and vehicle traffic, dog waste, road salt — and the list goes on. Curbside plantings along a busy street create a natural barrier between people and traffic. They beautify the street and the neighborhood while shielding, or at least distracting, pedestrians from unpleasant sounds and smells. Bio-swales are another form of hellstrip gardening. They help to reduce water runoff and remove pollutants from the environment. In a residential setting, a hellstrip planting can blur the end of the home garden and extend it to the street, making what can be a solitary endeavor into a social one. Of course, flowers may be picked, plants trampled (or worse, stolen), but planting with these hazards in mind can minimize both the emotional and financial damage. Hogan told a story of two young boys who were walking in front of his home and batting at the plants with sticks. Instead of yelling for them to stop, he talked with them about the plants. The next time he saw the pair they were educating a couple friends about those very same plants. Desperate for more space in which to garden, avid gardeners often resort to taking over every last scrap of neglected soil, including the strip between the sidewalk and the street. Perhaps that underutilized sliver of ground is the perfect place to introduce newcomers to the joys of gardening? No one enjoys the chore of mowing a lawn in a parking strip. By its very nature, that strip is a small, defined project, and is a far less intimidating undertaking than removing and planting the entire front lawn. Is a planted hellstrip easier to care for than lawn? Not always, Daniels said, but choosing the right plants can lower maintenance. Hadden pointed out that some people may be leery of tackling a hellstrip because they think it can only be one of two possible styles: a tidy lawn or a wild mess of overgrown plants. In reality, a hellstrip garden can be any style: formal with geometric layers and textures, minimal with two or three repeated plants, a lawn “alternative” with plants that you can walk on, or even cottage style with casual floral abundance. As style options are explored, plant choices come into focus. “Right plant, right place,” reminded Daniels. Matching plants with their growing conditions can ensure the garden will look good year round. In his personal garden, Hogan planted the hellstrip with a wide range of exotic plantings certain to stop passersby. He kindly provided a pair of benches for folks to sit and soak up their surroundings. Hogan lives in a dense residential area along Northeast Fremont Street in Portland, where street parking is a commodity, so he created several paths through the plantings. By giving people a place to put their feet, he minimized the chances they’ll end up stepping on a plant. By building up the soil, he created better drainage for the plantings and another impediment to people making their own paths. Maurice Horn, co-owner of Joy Creek Nursery, tackled a 10-foot-by-125-foot, scrap-filled hellstrip as part of a low-water project on land owned by Reed College in Southeast Portland. He advised doing plantings like this in the fall, when the still-warm soil and imminent winter rains will get the plants well established before they face the true test of a hellstrip — summer heat. Not every plant will thrive in street-side conditions. “Poor plant selection can turn a potential positive into a headache: more maintenance, or a messy unkempt jumble that challenges neighbor relations,” Daniels cautioned. Hellstrip plants need to be tough enough to stand up to abuse, sized correctly for the space so as not to obstruct sightlines or interfere with overhead utility lines, and should remain upright — no flopping allowed. Little Prince of Oregon, a wholesale nursery specializing in ground covers, ornamental grasses, ferns, native plants and succulents, grows a wide range of plants suitable for hellstrip plantings. Ryan Seely, sales manager at Little Prince, recommended a trio of thyme selections: Thymus serpyllum ‘Elfin’, T. citriodorus ‘Archer’s Gold’ and T. doerfleri ‘Doone Valley’. T. serpyllum ‘Elfin’ stays especially tight, forming a nice evergreen mat, but all three tolerate foot traffic and release a lovely scent when disturbed. Hadden said “self-healing” understory herbs, like mint and oregano, smell lovely when walked on; when broken, they typically re-root in place. Sedums are also self-healing, and Little Prince offers several. Sedum spurium ‘Dragon’s Blood’ and S. spurium ‘Voodoo’ both have red coloration. S. tetractinum has bigger foliage and turns a showy bronze and burgundy color in fall. Seely also recommended S. reflexum ‘Angelina’. This bright chartreuse sedum has been called aggressive, but in a hellstrip it remains within defined boundaries. In fact, the contained nature of a hellstrip offers an opportunity to grow plants that might otherwise be shied away from because of their aggressively spreading nature, such as Euphorbia robbiae and Aegopodium podagraria ‘Variegata’. A few highlights from Horn’s plant list from the Reed College project include Grevillea victoriae, Yucca filamentosa ‘Color Guard’ and Veronica peduncularis ‘Georgia Blue’. Horn also planted bulbs like Tulipa greigii ‘Red Riding Hood’ for spring color. Horn also recommended several grasses that are ideal for the hellstrip environment — and one that is not. Growing 3–5 feet tall, the often used and much-loved Calamagrostis × acutiflora ‘Karl Foerster’ is too tall for a hellstrip. Instead, Horn selected C. × acutiflora ‘Overdam’, which gives a similar look but tops out at around 2–3 feet. Panicum virgatum ‘Shenandoah’ earned its spot with bright red color and a slow-growing, short habit. In his narrow, low-maintenance, no-water hellstrip, Greg Shepard, co-owner of Xera Plants in Portland, included decorative grasses, including the highly ornamental Schizachyrium scoparium ‘The Blues’, Callistemon viridiflorus ‘Xera Compact’, C. pityoides ‘Mt. Kosciuszko’, Halimium ocymoides, Carex tenuiculmis and Yucca linearifolia. An entire book could be written on selecting the right trees for hellstrip plantings. Until then, Hadden recommended Amelanchier × grandiflora ‘Autumn Brilliance’ for small tree structure with great fall color, and Crataegus viridis ‘Winter King’ as a medium grower. Both are low care and low mess, not picky about soil, and highly ornamental. Medium-growing Celtis occidentalis attracts wildlife, has small berries, beautiful bark, and is recommended by many zoning departments. Hadden underscored the importance of considering where small trees grow in their natural habitat. Planting a tree that prefers to grow in a protected understory out in an exposed hellstrip is asking for trouble. When planted properly, hellstrips will continue to grow in popularity as viable gardening spaces. As more property and business owners look for alternatives to lawn, barren soil, gravel or blacktop, the “public faces of our spaces” will become more alive, attractive and interesting.